"He is despised and rejected of men; a Man of sorrows, and acquainted with grief: and we hid as it were our faces from Him; He was despised, and we esteemed Him not." It was said of Him that He was both the "Man of sorrows" and that He was anointed with the "oil of gladness" above all men. At first that doesn't seem to make any sense to me, especially when I look at my own life. I have recently been dealing with an extremely painful bout of tennis elbow. I wouldn't mind it quite so much if I actually played tennis. In fact, I can't figure out what led to the inflammation of the the tendon in my elbow, but it caused incredible pain until the orthopedic surgeon injected it with steroids. I am hate to confess to you that I have done my share of complaining about this pain. My elbow pain was a small "sorrow" in the scope of the history of sorrows. I don't think I really had much right to complain about it. There are many people out there who are in much more pain for a much longer time. Our Lord Jesus lived with sorrow all of His life. How it must of been for the omnipotent God of the universe to live in a fallen, cursed world and to not be able to heal and to ease the pain of those around Him until He was thirty and began His earthly ministry. How the sights and sounds of sin around Him must have pierced His heart emotionally, especially knowing He came to take a literal spear in His heart for those very sins! Yet, the gospels don't portray Christ as a dour, sad man. We don't hear any tales of His complaints or whining. The Scriptures speak of Christ being "moved with compassion" at the funeral of the widow's son, where He raised him from the dead. We read of His tears at Lazarus' grave before He recalled him to life. But no complaints. We know that the exceeding sorrowfulness of His soul resulted in "sweat as it were great drops of blood falling to the ground." Yet the Scriptures tell us He was anointed with gladness and that "for the joy that was set before Him endured the cross." As with the rest of His life, He has given us the pattern to follow. Just as the Lord gave Moses the pattern for the tabernacle -- the earthly temple in which the Lord would dwell for the Jews -- the Lord Jesus is our tabernacle, our pattern and His Holy Spirit now lives in us. We can look for the joy that is set before us when we encounter sorrow and suffering today. We can, as did our Lord, seek our Heavenly Father for guidance, counsel and comfort. We can trust Him that even when our "flesh is weak," His will for our lives is perfect. His way is always, will always be, perfect. Let us exchange the sorrows of this world for the joys and gladness of the heavenly places where the Lord Jesus has already placed us. Let us live there and make the choice to "rejoice in the Lord alway, and again, I say rejoice." My husband and I approach the cool water at the beach in very different ways. If the temperature of the water is a little too cool for comfort, I like to dive right in and be completely covered with it immediately. Although the initial shock is greater, it moment is soon passed and my body quickly adjusts to the water temperature. My husband, who is not a fan of the beach much anyway, prefers to gradually make his way into the surf, letting his body adjust bit by bit. Some people who enter the water this way prefer it because it allows them to escape getting completely wet, while with my way there is no way to prevent being soaked from head to toe. There is no "better" way to enter the surf. However, when it comes to our spiritual life, there is no such thing as a slow progression into Christ. When we trust in the Lord Jesus Christ as our Lord and Savior, we are --in a spiritual way we cannot fully fathom -- baptized together into His death and raised again into "newness of life." The Apostle Paul says this is such a dramatic event that "Therefore if any man be in Christ, he is a new creature: old things are passed away; behold, all things are become new," (2 Corinthians 5:17.) The old person we were was crucified with Christ and we are raised a new creature. So lovely is the new creature we have become Paul says it is "created in righteousness and true holiness." We have not been merely dipped, part by part into our Lord. We have been totally immersed, dived into Him. We have not been changed just a little, we have been totally transformed and raised again. Because of this, it is incumbent upon us to walk as those that are alive from the dead. When Glen came into the room to tell me about the phone, he was remarkably calm. The only way his demeanor could have been more peaceful as he said the words, "I have bit of an emergency," would have been if he had said the words with a slight English accent. For those of you who own smartphones, you know the sense of panic that can ensue when something has happened to your phone. If you are like me, virtually everything you need is on that phone. "You must learn to hold everything loosely. . .everything. Even your dear family. Why? Because the Father may wish to take one of them back to Himself, and when He does, it will hurt you if He must pry your fingers loose. Remember. . .hold everything loosely. Everything." There should be nothing in our lives that we are afraid to loosen our grasps upon. If we look out toward the future and think "If I were to loose this thing --or this person -- I could not handle it," then two things are sure. First, we are traveling into the future without the Lord. We are assuming that we will even have the next breath, which is not guaranteed for any of us. Then we are, as Corrie Ten Boom would say, "...carrying tomorrow's load with today's strength- carrying two days at once. " Secondly, we are denying the fact that Christ is all we will ever need in any situation. He is the "God of all comfort," and our "all in all." If we don't believe, if we don't know deep within our heart that no matter befalls us, God will be enough in our every situation, then we don't know our God well enough. The problem is not with God it is with our faith and belief in our God. My senior year in high school started off with a surprise. There was a new girl at school, and in our relatively small school, that was big enough news in itself. But there was a twist to this news which made my first few days at school very interesting. "The new girl looks just like you!" It seemed as if I heard that comment from just about everyone, yet it was several days before I had an opportunity to meet "the new girl" for myself. When I saw her, I was almost disappointed. I was expecting a mirror image. We did have the same hair color and of roughly the same style. We both had big, dark brown eyes. We were about the same height, and like every other girl in our school, we wore the same uniform. Other than that, we agreed that we didn't really look too much alike. Everyone else seemed to think we did, though. Janet was a sweet girl, and I didn't mind sharing my "identity" with her too much. We joked about it even though neither of us saw the resemblance. When next to each other, our differences were more obvious than the similarities. The Apostle Paul speaks to the Corinthians of one preaching "another Jesus" and of "another spirit" and of "another gospel." Sometimes I wonder what are those things in my own life which are the "anothers." I don't mean false teachers and false prophets. . .those are often easy to spot. I mean those "anothers" which distract and pull us away from our real priorities. They don't have to be wrong things in and of themselves --in fact, they may be very good things-- they may just be things that divide us from what the Lord may really be intending for us in that moment. Each of us probably has our own set of "anothers." I for one, am a political junkie. I could read the news all day. I love my Twitter feed, and I love pouring over news sites online. I once had a political blog but had to stop it because it sapped so much time and energy away from those things which were much more important. It is clearly one of those "anothers" to me. For some, crafts may be an example of an "another." For some, as good and well-intentioned as it seems, exercise may be one of those "anothers." Literature, music or television could be one for someone else. I am not saying that these things are bad, or dangerous. But each of us has some area where we can be pulled to spend too much time, too much energy, too much excitement, when the Lord would have preferred that we spend that time praying, reading the Bible, caring for someone else, or doing something else He has led us to do. Let us be so familiar with the real thing, that the "anothers" stand out in stark contrast. Let us guard our time wisely so we are certain to be good stewards of this precious gift we have been given. As our dear friend Larry says, "Let us keep the first thing the first thing and the main thing the main thing." At the gym where I go to work out there is a little boy who comes with his mother. He likes to run around the track behind me, jump on the steps I jump on or over and basically be a part of my exercise "team." He has as much cuteness as one little boy can squeeze into his body. He is polite and helpful, too, which makes him a pleasure to have around instead of a nuisance. The other night, as I was ending my workout, and stepping up on my step for what seemed like the hundredth time, he was standing beside me watching me. I asked him how old he was. "Four." That seemed about right to me based on my experience with little boys. Then I asked him how old he thought I was. He looked at me for a minute and said, "Twelve." Immediately he had a friend for life! I think I laughed all the way around the track. His perception of time obviously wasn't too well developed yet. My little friend really has it pegged though, time is all a matter of perception. It isn't real in the sense of eternity, its just what we use here to mark our days, weeks and years. In heaven, there will be no sun, no moon, no more time. 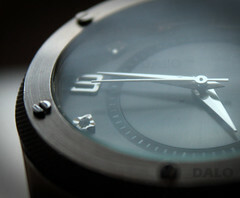 Just imagine, a place where there is not a watch, not a clock in sight! In my line of work, time is essential and there are clocks everywhere. All our fetal monitors are in sync with all our computers so that everything agrees time-wise. Perhaps that is why I have a hard time wrapping my brain around the concept of a time-free existence. No time, no aging, no deadlines. I may not be able to understand it, but I am sure looking forward to it! A few weekends ago, our grandchildren spent the night with us, but it was a night when I was working. I didn't get to spend much time with them before I had to head off to the hospital for my night shift. They weren't too upset, since they love the time they spend with their Granddaddy, Aunt Emmie and Aunt Marie as well. When my husband picked me up at work the next morning, Jackson and Emma were already awake and in the backseat. I was as glad to see them as they were to see me, but again, I didn't have much time with them. I was due back at the hospital that evening and my bed was calling me. As I was in the bathroom getting ready for bed a little hand knocked on the door and Jackson called out to me. "What do you need, Jack?" I asked even as I was opening the door. "To give you a big hug!" was his response, and he flung his arms around my neck and hugged me tight. As he did, he said, "Have a good rest!" I chuckled at the sweet works coming from the little boy. "Have a good rest." It was exactly what I needed, and exactly what I wanted, but it was so much better to be encouraged in it from one I loved so much. I think if we could audibly hear the Lord speaking to us, we might hear those very same words. "Have a good rest." Our Lord doesn't want us to fret and worry about anything. He has given us His Son and in that one Gift He has provided all we can ever or will ever need. He is aware of every detail of our lives and not only knows about them, but cares about them as well. And He wants us to rest. If He cares enough to number the very hairs of our heads, then surely He cares about every thing else. Let us trust Him and ". . . labour therefore to enter into that rest" that He has for us. Let us cast all our cares upon Him and truly believe that He cares for us. The night started well because I was able to sleep easily. Then after a few hours I began to toss and turn. As much as I tried, I couldn't get back to sleep. After what seemed hours, I turned to look at the clock, surely it was close to morning. It was 3:17. Wide awake in the middle of the night. . .what to do? Immediately someone I knew came into my mind. I knew this person was going through a difficult time so I said a quick prayer for them. Then as one person after another came to my mind, I used my sleeplessness as an opportunity to pray for these people that I believed the Lord had laid upon my heart. I didn't have to know all the details of their situations, the Lord knew all that. I was just blessed to be allowed to join in the communication that probably always exists between the Father, the Son and the Holy Spirit. So, if one night you wake up with someone on your mind, maybe the Lord has given you the opportunity to pray for this dear one. Use your moments of sleeplessness to offer up prayers for those who come to your mind. They don't need to be lengthy or elaborate prayers, sometimes the simplest prayers are the best. "Praying always with all prayer and supplication in the Spirit, and watching thereunto with all perseverance and supplication for all saints;"
They were absolutely gorgeous, these shoes sitting on the counter in the store. Their shiny, burgundy leather caught my eye from the very start, but once I had tried them on, it was love. There was only one thing I didn't like about them. . .the price tag. They were just more than I was used to paying for shoes and I couldn't bring myself to buy them. I left them on the shelf and walked out of the store. For several weeks I "visited" those shoes. At least every couple of weeks, usually after payday, I would return to the store. I might have said I was looking for something else, but I always knew I was looking for those shoes. I never went to the shoe department first, though, I have always liked to save the best for last. After I had done the rest of my shopping, then I would go to the shoe department and look at them. Often I would try them on yet again. They still looked just as good as they had before, and the price tag still prohibitive to purchasing. My husband urged me to buy them, but I just couldn't justify spending that much money on a pair of shoes, especially when I already have plenty of shoes. Again, I left them on the shelf and walked out empty handed. Then one day, I think shortly after receiving a bonus at work, I decided I was definitely going to buy those shoes. This time I went straight to the shoe department and headed right to the shelf where "my" shoes lived. Only they didn't have my size anymore. I tried on the size above mine, too big. I tried on the size below mine, too small. They had my size in the black version, and I tried them on, but they weren't nearly as beautiful as the burgundy ones. Yet again, I left the story empty handed, but this time much more disappointed. I hadn't thought about those shoes in months. In fact, I hadn't visited that store much since then, but we went there yesterday. I shopped around without finding anything that interested me, and then as usual, I headed to the shoe department. I looked around and then passed by the clearance table. I was shocked to see four boxes of the gorgeous burgundy shoes piled up on the clearance table. None of them were my size. I tried on the largest size in the stack, the one sitting on top, not expecting them to come close to fitting. I was shocked when they fit perfectly! There is no way that shoe has the correct size on it, because I know my foot has not shrunk in a few months. Then I looked at the sign on the table. Originally the items on the table were 50% off, but this day they were an additional 25% off as well. I walked out of the store carrying my gorgeous shoes after only paying a fraction of what I had expected to months before. No, I don't think it is any coincidence that the shoes that are obviously the wrong size for the box, but the perfect size for me, were sitting on the top of the stack on the sale table. I also don't think it was a coincidence that they were sitting there the very day we decided to go back that store for the first time in weeks. I do think, though, every time I look down at my beautiful burgundy shoes I will be reminded of just how much my Heavenly Father loves me. I do think I will be reminded that there is no detail in our lives that escapes His notice, His care or His concern. "Thou openest thine hand, and satisfiest the desire of every living thing." Today in one of our services we sung an old familiar hymn with the line, "are your garments spotless, are they white as snow?" Immediately I thought of the white shirt I had worn the day before. I didn't notice it until after we had left the house (doesn't it always seem to happen that way,) the faint stain on my white shirt. I have washed that shirt, I have even bleached that particular stain numerous times, but all my efforts have been futile to make that one small spot as white as the rest of the shirt. Even though I have spent a great deal of energy and done the very best I could, and the best I know how, I have been unable to remove the spot. My efforts have fallen short. If someone were to point out the stain to me, they would think me crazy if I replied, "Oh, my shirt is fine because I've done my best to get rid of the spot, and that's all that matters." We can no more remove the spot of our sins from our own souls than I can that one tiny spot of stain from my shirt. We must rely on the cleansing power of the Blood of the Lamb to cleanse us from our sin and make us "as white as snow." I would join with Elisha Hoffman and ask, are your garments spotless? Are they white as snow? Are you washed in the blood of the Lamb? Like in the time of Jesus, when He told the Pharisees and Herodians to "render therefore unto Caesar the things which are Caesar's. 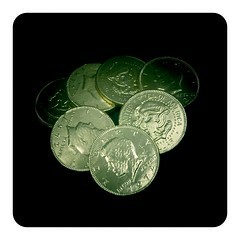 . . " our coins and dollars today bear the images of our Presidents and great leaders of the past. Washington, Jefferson, Lincoln, Hamilton, Grant all grace our money. We do well especially on this day of the year to remember it is good to "render therefore unto Caesar the things which are Caesar's." But what things are God's that we are called to render unto Him? WE are that which is God's. We bear His image, created in His image, after His likeness. What that means I cannot explain to you, but I know the Lord said it, so therefore it must be true. We are His and we are to render ourselves to Him just as faithfully and surely as we render our taxes to our modern day Caesars. Can there be anymore joyful rendering than the giving of ourselves into the hands of the loving and just God who created us in the first place? we are His people, and the sheep of His pasture." "I didn't kill my husband, but I think he was happy to die." "If you find out where I am, please come and tell me." These were comments made to us today by a dear friend of ours who lives in the nursing facility where we do chapel services. We were making room visits, and as usual, I always leave Ms. Johnnie's room laughing. I never know whether she means to be quite as funny as she comes out to be or not, but she is a delight to visit. Ms. Johnnie had been with us for years and then moved to another facility for several months. We were so pleased to see her back one day and told her so. "Ms. Johnnie, we have missed you so much! We are so glad to have you back!" "Oh! Where have I been?" she quipped in reply. I don't have any idea of how old Ms. Johnnie is, she is one of those women who has a timeless look about her. Pictures of her family are lined upon the window-sill of her room and she tells us she has a big family. "You never know how big your family is until you start buying them Christmas presents!" When we begin to sing with her, Ms. Johnnie sings the words to the old hymns she has probably sung most of her life. I imagine the words tumble out without her even having to think much about them. . .I know that's how it often happens for me. Her voice is sweet and soft. I could spend days writing about sweet people like Ms. Johnnie, Mrs. Eunice, Ms. Martha-1 and Ms. Martha-2 (roommates until recently), Jim Kelly, Bonnie, . . .the list could go on and on. What a blessing they have been to us in the ten years we have been doing this! My point is that there are so many wonderful, sweet, diamonds of persons who would love someone to just stop by their door, say hello, perhaps sing a song and say a short prayer. Many can no longer see well enough to read their Bibles and would love someone to just sit for a minute or two and read the Scriptures to them. If you are looking for a way to bless someone, looking for a way to give of yourselves to others, I encourage you to call a local nursing facility today. Speak to the Activities Director or Nursing Director. Ask if you could come by to just read or visit or sing. . .or whatever it is you love to do. . .with these dear people. You may be giving a blessing, but I promise you, the blessing you receive will be so much greater. I Don't Have to Wonder. . . Sometimes when our patients have spinal anesthesia before a Cesarean Section, the anesthesia numbs the section of muscles along their rib cage that allows them to "feel" their own breathing. This can be a very frightening sensation for some women. "I can't breathe!" they frantically cry and we often have trouble reassuring them that if they have enough air to speak, they have enough air to breathe. Because they can't feel themselves breathe, they don't believe it is happening. We don't realize how much we are aware of the sense of our own breathing, until suddenly that feeling is gone. By the same token, we don't realize how much awareness we have of the presence of God in and around our lives. Someone in a moment of extreme pain or crisis, regardless of their spiritual belief, will often cry out to God. Why is that? Is it just a cultural phenomenon? No. It is because ". . .in Him we live, and move, and have our being;" (Acts 17:28.) We all have a sense, an awareness that there is more to this world, more to this existence, than just ourselves. Some who want to reject the notion that it is God, will call that awareness "the force" or "the cosmic energy." The name they give it doesn't change the fact that it is indeed, God the Almighty, the Creator and Sustainer of the universe. Why does it make some so angry, so incensed when Christians speak of the Lord Jesus Christ? I do not get incensed when people speak of their false gods. . .I feel sorry for them, I pray they will come to know the truth, but I don't spew hateful epitaphs toward them, or desire to eradicate them from the face of the earth. Could it be that deep within their hearts the very creation itself has called out to them that there is one true God? That their very breath has told them that Jesus Christ is His Son and that there will indeed be a day of reckoning when all men will be asked the question, "What have you done with my son, Jesus Christ?" I don't have to wonder if I am breathing. . .I feel it to be true. I just know it to be true. I don't have to wonder if there is a God. . .I believe it to be true, I see the evidence of it every time I open my eyes. For that matter, every time I take a breath He has given me to take. There is no mistaking it. There is a God. His Son is Jesus Christ. We each have a choice to make regarding those two statements and we will be held accountable for those two choices. Today while my husband was speaking at the Retirement community where we do services, I was looking at the black and white tiled floor. I noticed how the black tiles showed all the white specks of dirt and dust and the white tiles showed all the dark dirt. We have a friend who has just this pattern of floor in much of their downstairs and he has told me it is very difficult to keep clean. "Every speck of dirt shows up on it," he explained. If the tiles were tan or grey, or even patterned, that would not be the case. It is the stark whiteness which shows up the dark dirt so well and the solid darkness which showcases the white dust so clearly. There are some who have rejected the Bible because they say it is "too black and white." Meaning that the lines between right and wrong are too clearly delineated. These are people who would prefer a bending of those definitions. . .perhaps the idea that "if it feels right, do it." But that is not the truth as the Scriptures present it. In fact, the Scriptures are very much like the black and white tiled floor. The black tiles show up white dust and specks while the white tiles show dark dirt and grime. The Scriptures are given in our lives for "doctrine, for reproof, for correction, for instruction in righteousness:" and to be a "discerner of the thoughts and intents of the heart." The more we avail ourselves of the Scriptures, the more immerse ourselves in it's truths, the more it will work it's work as a "two-edged sword, piercing even to the dividing asunder of soul and spirit, and of the joints and marrow." The Bible, which seems too "black and white" for some, is exactly the spotlight the Lord intends to point out what needs correction, to instruct us in righteousness and to reveal the very thoughts and intents in our heart that we can never reveal by ourselves. Recently, our Grandson Jackson expressed an interest in learning to do some magic tricks. At six-years of age, Jackson perceives that magic tricks contain, well, magic. He doesn't realize they are exercises of slight-of-hand and illusion. They are basically planned deception. While I am quite sure it will be fun to teach him some slight-of-hand, I hate to see his little face collapse when he realizes there is no real magic involved. It is amazing how much of our lives are steeped in deception. The wood floors we walk upon are often "faux wood." We are constantly encountering "simulated this" or "computer-generated that." Watching the original "Wizard of Oz" and realizing the tornado scene was composed of a thirty-five foot long muslin sock, instead of a computer generated imagery, somehow makes it more impressive to me today than perhaps it was when it debuted in 1939. We are reaching a point where we can't even tell what is actually real and what is the deception. And that's the point, isn't it? To be so real that it fools the eye, deceives the senses, that is the purpose of the deception. We must all realize that sin in our universe began with the express intent to deceive. Satan deceived Eve as the Scriptures clearly point out. "And Adam was not deceived, but the woman being deceived was in the transgression, (1 Timothy 2:14.)" We must be careful, diligent and mindful that the possibility is always out there to be deceived. Adam and Eve were sinless and in a perfect garden and they met with deception. How much more we, who have enemies to assault us every day, can face this possibility? Let us "hold fast that which is good" and "prove all things." Faux wood floors are fine, but deception in our spiritual lives is not. CGI in our movies is a great tool, but twisting and manipulation of the Scriptures is not. Let us be aware that it only takes a little thing to change the real deal into a deception. Yesterday I had two unexpected pleasures from very unexpected sources. Last night during our Bible Study I happened to be seated almost directly across from a young mother and her little daughter. Penny Lynn is about seven months old and full of curious energy. Her mother was using all the techniques a new mother has to entertain one so small and I found it difficult to take my eyes off the beautiful little girl. At one point, Penny Lynn sat down next to her mother and when she did, her line of vision caught my eye. I gave her a big smile and I was surprised to be greeted with a huge smile in return. Even though Penny Lynn had no way to speak to me, it was clear we were communicating and the "discussion" filled my heart with joy. Her smile was not just a "discussion" between me and Penny Lynn, it was a repeat of another "conversation" I had been involved in earlier in the day. Living at the nursing facility where we do Chapel services is a sweet woman named Mrs. Anne. Not much older than I am, we knew Mrs. Anne many years ago when we attended the same church with her and her husband. Mrs. Anne can no longer speak in any way. Like Penny Lynn, she is virtually silent. Mrs. Anne's mind is now trapped in a body which only occasionally allows glimmers of the person we once knew. I saw one of these glimmers yesterday. As my husband and I stood at the podium to begin singing the hymns for our service, Mrs. Anne was positioned directly ahead of me. She was looking in my direction, but I didn't sense there was any recognition of who we were or what we were doing. Then Glen said something that amused me and I chuckled. I looked at Mrs. Anne and gave her a big smile, and just like Penny Lynn, she surprised me by looking me squarely in the eyes and giving me a big smile right back. This time it was very clear to me we were communicating even though it was impossible for us to exchange words. The moment, though brief, filled my heart with joy. In both of these instances, I had given so little, but in return I had received so very much. I was more than able to communicate, not only in gesture but in words, with both Mrs. Anne and Penny Lynn. Neither of them were able to communicate with me except in a very limited way. Their expressions to me, although an equal response to mine physically, were a much greater response in communication because it was the only vehicle through which they could communicate. Who received the greater joy in the communication? I would be the first to tell you I am quite sure in both instances I did. The Lord lavishly gives His love to us at great expense to Himself. We appear to reap all the benefit because He can do so much more than we can do. He is all-knowing and all-powerful. But when we return that love to Him, His heart is blessed, to the point He said our voices are "sweet" to Him. Our prayers are so special to Him the book of Revelation refers to them as the incense offered at the golden altar before the throne of the Lord. Now that Easter is past I can admit it, I hate lilies. Easter lilies stand so tall and graceful. I love their beautiful arching petals. 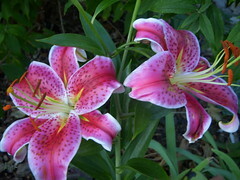 I especially love Star-gazer lilies. These have such a beautiful red color, they are by far my favorite lily. For sheer sentimentality sake, I love day lilies that remind me of the orange flowers that surrounded my mother's patio and bloomed with great vigor each spring and summer. What I hate about lilies, however, is the pollen they produce. When I see lilies in a store I immediately either cover my nose and mouth as I pass by, or seek a route whereby I can bypass the flowers. Otherwise I will end up with a stuffy nose, itchy eyes and in the very near future, a terrible migraine. I did not know I was allergic to lilies until my father died and the girls I worked with sent us a beautiful Easter lily. It was extremely fragrant and had to be relegated to a far area of the house. When I realized it was the source of my upper respiratory problems and migraine, it was sent outside. I began to notice after that even the slightest exposure to lilies had a dramatic effect. There is one Lily however, to which I have no allergy. It is THE Lily of the Valley. How wonderful that the very first lily I can embrace without discomfort and fear will be The Lily of the Valley, the One who has created all other lilies. I think I am very happy to wait for Him. The hospital in which I work has been in the process of changing the color scheme. The hallways have been shades of browns, from dark beige to actual brown. Now they are white. . .crisp, clean bright, white. The first time I rounded a corner and encountered one of these newly painted hallways I felt as I had stepped into heaven. In fact, the change had been so seamless, almost instantaneous, it reminded me of a conversation I had with our dear friend Tom Webb on March 19, 1997. If you have read this blog for any length of time you will be familiar with this story. Tom had heard the news my father had passed away unexpectedly the day before. He called me and said, "I heard your father moved to a better neighborhood." My father had been taking a letter which had been mis-delivered to his house. The doctor told me he probably never knew "what hit him" referring to his heart attack. He took one step down his road and the next into Heaven. When I walked from the brown hallway into the white hallway there was no delay, no lag in my step, no stopping. I was walking in one hall and then suddenly I was walking in another. I am convinced this will be how our change from this life of mortality, to our lives of immortality will be. Like my Daddy, one step here, one step there, like walking through a portal. across the street. I couldn't see him, but the sound of his pecking resonated throughout the neighborhood. I thought our granddaughter, Emma, who was at our house at the time, would be interested in listening to the woodpecker as he searched for his food, so I called her outside to listen to him. As we listened to the woodpecker and the echoes of his working, I thought of how the Holy Spirit is not visible inside of us, but His effect in our lives is apparent to all around us if we are obedient to His will for our lives. The echoes of His working is us will resound all around our families, our neighborhoods, our workplaces. Let us follow His path for our lives so that all those around us can Hear Him in our lives.